Yes, this is an actual song that I have been listening to nearly every day for the past 2 weeks, but this morning as I arose singing those words I began reflecting on this past week and saw how those words were a part of every experience I had. I saw how each experience was filled with opportunities to joyfully connect with the Divine!..From spending time in nature and welcoming the spring season with friends, family, and blissfilled music to celebrating the 90th birthday of my great-aunt Marie. 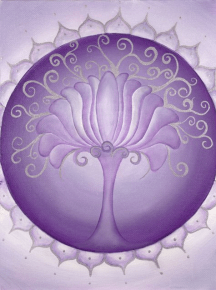 This week was truly one of “joy, freedom, passion, and presence” and it feels perfect that each of those opportunities occurred leading up to todays message where I am including the image and stones for the Crown Chakra. p.s. I hope you will be able to join me this week for my free conference call 8 Stones to Empower Your Journey ..Tuesday, March 27th at 7:00 pm cst. I am so excited for this event…I don’t want you to miss it…register now! …the color violet, is located at the crown of your head. It is responsible for all aspects of connecting with the Divine. 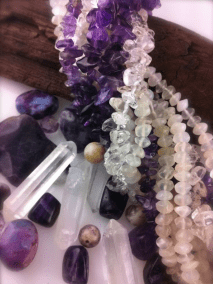 Amethyst…provides a sense of being grounded and secure with connecting with the Divine. It awakens a knowing of your own Divinity. Chariote…connects one with their life’s sacred journey. It offers the courage to step in and embrace their sacred path. Moonstone…a stone of relection, Moonstone reflects how the rhythms and cycles of the moon mirror those in our own lives. When we move with those cycles we experience life with grace and ease…we ebb & flow like the tide. Rutilated Quartz…helps one to flow with the grace & beauty of the Divine. It expands ones vision of self, of the world, and their connection to all.